I walked in Gordath Wood on Wednesday. Went right by the morrim and everything. 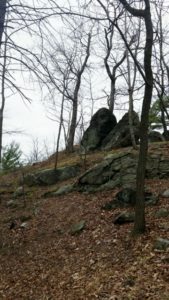 Sometimes I’m taken by surprise by how much these Connecticut woods informed my first novel. It’s like visiting a movie set. Oh, there’s the ledge Lynn tumbles down. Oh, there’s the horse farm where the book begins. 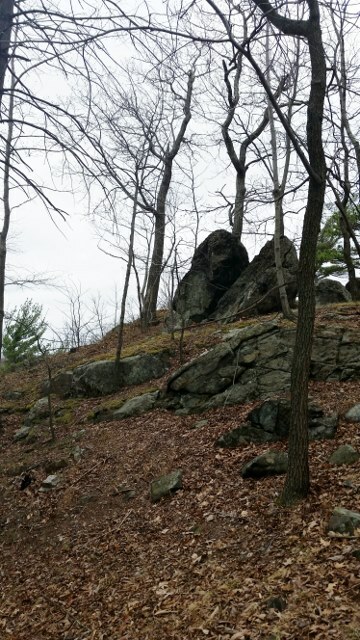 Oh, there’s the mysterious Balanced Rock in North Salem, NY, which plays an integral role in the novel. Be careful of the woods. You never know where you are going to end up. broken boulders hulked under the trees, the sapling swaying in its stone prison, the vines fluttering. She heard whispers from the stone, voices just beyond the reach of her hearing. Just the wind, she told herself, looking harder and seeing nothing. The wind, or whatever it was, faded, like a conversation she was listening to on a distant radio. … It wasn’t the wind. She knew that. The whispering emanated from the split boulder, rising and falling, and she felt cold shivers spike along her spine at the sense of malice that tinged the distant words.